Officer Tian Chavez goes undercover at a college in Durango, Colorado as Tian Whithern, a gangster. It’s not the first time he’s taken such an assignment, since he looks years younger than he actually is. Finding out who’s offering strength-enhancing drugs to students and other townspeople takes a jaunt around the crazy maypole when he discovers the truth. It’s not drugs that give the ability, it’s completing a mate-bond with a paranormal creature. To his shock, he learns that gargoyles, shifters, and even vampires are real. Now, he needs to come up with a viable cover story. I was so excited when I read the blurb for this book and realized that it was about a gargoyle that finds his mate. I fell in love with gargoyles back when they had the Gargoyles cartoon on TV, and I fell in love with Goliath. He was gorgeous. Tall, purple, broad chest, square jaw, and super protective of humans especially his detective friend who knew about the gargoyles and had a crush on Goliath. The Truth is even Stranger storyline reminds me a lot of this cartoon but has enough differences to make it unique. For one, the detective’s a male in this story instead of a female like in the cartoon, and the gargoyles in the story shed their gargoyle skins and take on a human form after they’ve mated which they didn’t do in the cartoon. So if you didn’t like the Gargoyles cartoon, then you probably will not like this book. I, however, loved the cartoon and so loved that it has been adapted and turned into a gay series. 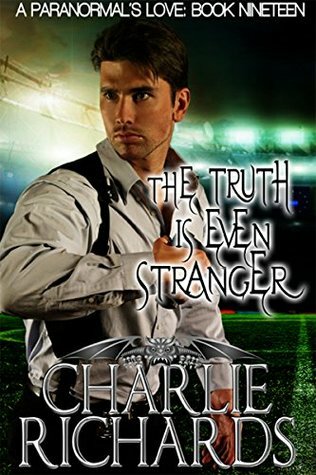 The Truth is even Stranger’s the nineteenth book in the A Paranormal’s Love series by Charlie Richards, but it’s the first book that I have read in the series. And given my love of gargoyles, I can’t wait to read the other 18 books in the series while I wait for the next one to come out. Chef Roman reminds me a lot of Goliath, same build and personality and wanting to protect his mate. He’s fairly new to the Durango Clutch having come from New York after having been betrayed and injured there. So he isn’t the greatest at communicating or showing affection to his mate. However, he can’t deny the mate bond’s pull. Officer Tian Chavez goes undercover as a gangster at a college in Durango to uncover a new drug that they have been tipped off to. Tian doesn’t know anything about the paranormal world until he starts poking around and becomes friends with some college guys that he thinks might be part of it. He fakes an injury to get in to see their personal healer so that he can snoop around the mansion. All is going well until he’s caught snooping around by non-other than his mate. Now he has a whole new world to learn about and mate bond that he has to learn to navigate. And choices to make about his future and his job. I loved the chemistry between Roman and Tian and how they slowly felt each other out with the help of the mate bond and learned how to trust each other. I can’t wait to go back and read the other books in the series and learn about the other mates in the Durango Clutch.